“And thou Philadelphia, the virgin settlement of this province, named before thou wert born….” William Penn’s prayer for Philadelphia is written on a plaque and rests on the east entrance of City Hall. Reading this inscription as a high school student, I was deeply moved and began my journey of seeking information about Penn and the Quakers. I was raised Catholic and attended Catholic schools, finding gifted mentors during my teen years. These religious nuns and priests fostered in us a sense of compassion and service toward others, skills of inquiry and love of learning. At my very large high school, I found my niche in the all-girls orchestra and received great gifts of learning music and a sense of community. At the same time, I felt disquieted in my spiritual life and in my worship experience. 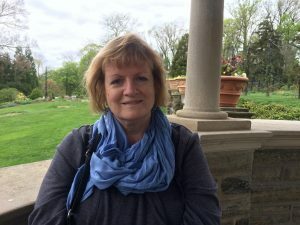 I embarked upon a discovery of finding and attending a Quaker meeting.Visiting Germantown Friends and later Arch Street Friends, I was welcomed and surprised by the warm embrace of several members who seemed equally surprised to meet a young seeker. During worship, I found that the silence and waiting spoke to my restless spirit and I began to attend regularly. I wandered spiritually for many years during college, inconsistently participating in mass and in a meeting, until finding my spiritual home at Frankford Monthly Meeting, located in the lower northeast section of Philadelphia. I attended Temple University as a social work major. Upon graduating, I eventually found work as a case manager at a Philadelphia based mental health/mental retardation center. The agency, CO-MHAR, was located in Kensington- North Philadelphia and served families and children. My job included managing a large caseload, advocacy and facilitating three parent groups. At a team meeting, I met my husband. At the time, he was completing his training in the Psychiatry Department of Temple University. In 1988, We were married at Frankford Friends and in the same year, I was received as a member of the Meeting. My husband and I have two now grown children. Matthew, age 27, attended Haverford College and Columbia University. He is currently working as a paralegal in Philadelphia. Our daughter, Sara, is 25 years old and pursuing a career in cello performance. She graduated from Peabody Conservatory/Johns Hopkins University in Baltimore and was trained at the Conservatory of Amsterdam for two years. During the children’s younger years, I was a stay at home mom until beginning part time as a teacher at Overbrook Preschool in Philadelphia. Sixteen years later, I remain employed at the Preschool. I am amazed and grateful for the many teachable moments our youngsters share and grateful for the parent and teacher community. My interest in parent religious education has been sparked by my own children. As a young parent, I sought to be a fair and loving parent, while remaining aware of our family values of honesty, integrity, compassion and loving kindness. Our family sought ways to be involved in Meeting and Yearly Meeting activities, including the children in First Day School and PYM Yearly Meeting activities. More recently, I learned about the work of the Quaker Parent Initiative. Throughout my working years, I have been interested in group work and have led small group discussions and lent support for parent to parent communication. In QPI, I find the approach encourages discussion, is spirit led and also practical. At our Meeting, a Parenting Course was taught and three years later, the parent group continues to meet once per month, adding new parents.